I’m excited to announce the release of my first co-authored work in the library profession– the twelfth chapter of an Association of College and Research Libraries (ACRL) book on mobile technology. The book is called “Mobile Technology and Academic Libraries: Innovative Services for Research and Learning” and the name of our chapter is “Tablets on the Floor: A Peer-to-Peer Roaming Service at Atkins Library,” authored by myself and co-workers Beth Martin and Abby Moore. The chapter is based on my work at J. Murrey Atkins Library (the urban research library on the UNC Charlotte campus). In 2015, I developed a new peer-to-peer roaming service at Atkins Library based on my research and assessment of mobile technology trends in academic and college research libraries. The program grew each semester following it’s original pilot into one staffed by eight college student workers. This chapter of the book pertains to the pilot program and the assessment methodologies that we conducted to inform modification to the programming. 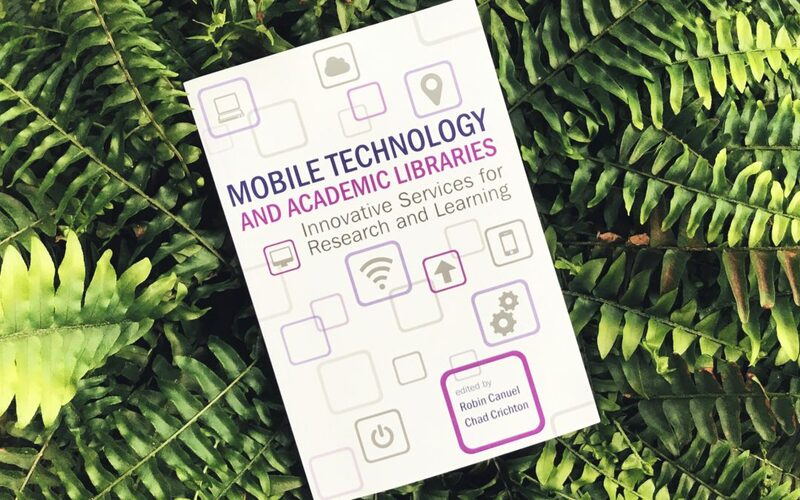 CHICAGO – The Association of College and Research Libraries (ACRL) announces the publication of “Mobile Technology and Academic Libraries: Innovative Services for Research and Learning,” edited by Robin Canuel and Chad Crichton. This is a detailed and thorough examination of technology that’s emerging now, and how to incorporate it into your library to help the students and researchers of both today and tomorrow. Mobile technology has become a ubiquitous presence in the lives of students and faculty. The maturing of this technology has led to our becoming more and more comfortable in a world where digital information flows seamlessly from screen to screen as we move about our daily lives. This evolution presents both risks and opportunities for academic librarians, operating in a field that is both uniquely tied to a static sense of “place” in the public imagination and at the same time passionately devoted to the freedom, spread, and accessibility of information for the public at large. In seventeen chapters ranging from A Mobile-First Library Site Redesign to Virtual Reality Library Environments, “Mobile Technology and Academic Libraries” explores how librarians around the world are working to adapt their spaces, collections, teaching, and services to the new possibilities presented by mobile technology. Leveraging the potential of smartphones, tablets, and even wearable technologies allows academic librarians to further expand their reach to students and faculty beyond the library’s walls. Furthermore, by understanding how mobile technology changes the behavior of library users, we can gain new insights into their needs and make improvements to our traditional services and spaces to better contribute to faculty research and student learning. “Mobile Technology and Academic Libraries: Innovative Services for Research and Learning” is available for purchase in print and as an ebook through the ALA Online Store; in print through Amazon.com; and by telephone order at (866) 746-7252 in the U.S. or (770) 442-8633 for international customers.